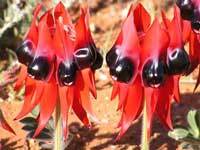 Sturt's Desert Pea (Swainsona formosa) was proclaimed the floral emblem of South Australia in 1961. And in keeping with New South Wales' Waratah and Western Australia's Kangaroo Paw, South Australia's Sturt's Desert Pea is a stunning, vibrant and unique wildflower. Its first contact with European explorers was in 1699, when the English buccaneer William Dampier collected it on his second sea voyage along the Western Australian coast. In 1999 is was proposed to reclassify the pea into a new genus (Willdampia - in William Dampier's honour), but this was not accepted. 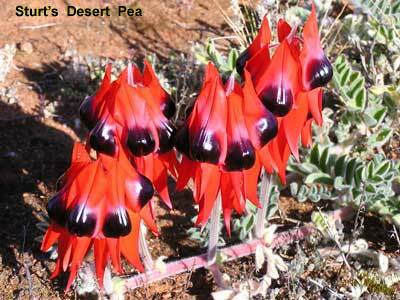 Sturt's Desert Pea is named after the 19th century explorer Captain Charles Sturt who saw it on his 1844 expedition to central Australia. 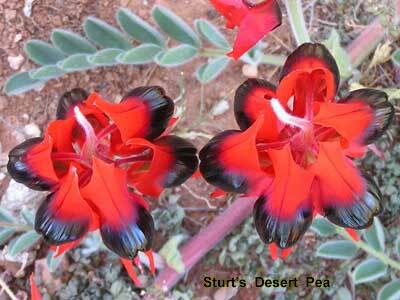 Also known as the Sturt Pea, it flowers in late winter and early spring - especially after good autumn rain. 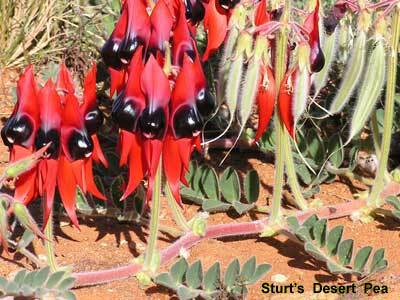 Sturt's Desert Pea can be found in the broad band of arid country that stretches from western New South Wales across South Australia to the west coast of Western Australia around Port Hedland. It also includes the south-western parts of Queensland and the Northern Territory. It is a perennial creeper, and the flower stalk usually carries six 8cm flowers which turn into hairy pea pods after flowering. The sage coloured leaves are about 15mm long. All of the photos were taken near Broken Hill in New South Wales.